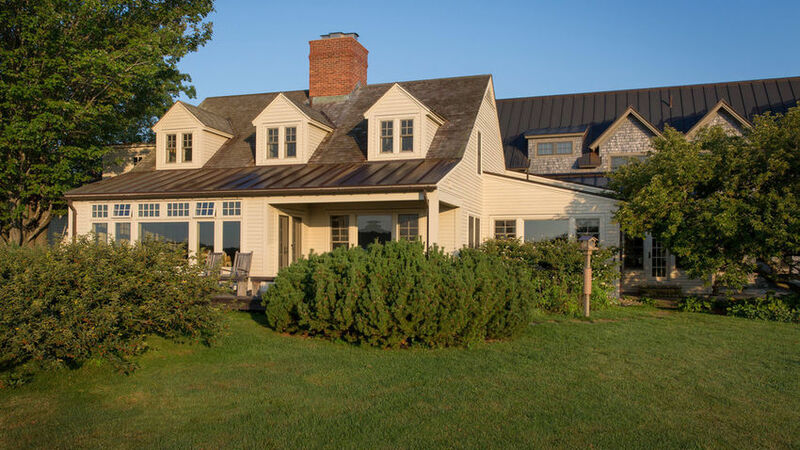 A retired NHL player and his family expand their former vacation home with a big addition and an interesting side-by-side design. After Eric Weinrich hung up his skates and retired from professional hockey, he returned to his native Maine with his wife, Tracy, their two children, and two black Labs. But the place they had enjoyed as a summer home for many years needed some TLC to make it work as their new permanent residence. 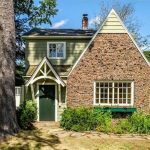 So they embarked on a renovation to update the cottage, enlarge the kitchen, and build an addition with a master suite, study, game room, powder room, and an exercise area, all while maintaining the spirit of the original structure. It wasn’t difficult to put a team together to get the project started. The couple knew interior designer Denise Stringer through a mutual friend and Eric’s father, John, is a retired architect. The restored cottage sits in front of the addition, which is clad in pre-stained cedar shingles. Maritime weather had taken a toll on the exterior of the original home over the years. The team removed the old asphalt roof and replaced it with western red-cedar shakes and a partial metal roof to guard against harsh winters. 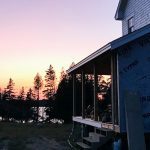 They also added copper gutters and trim and replaced rotted wood-framed windows with aluminum-clad wooden ones in the same architectural style. New wooden clapboards were coated with a solid tan latex house stain. 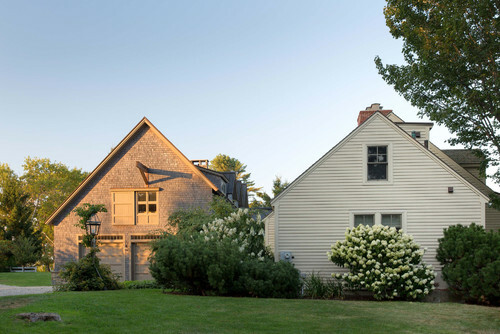 From the side, the addition and original house appear as two separate structures, but in fact they are connected by an enlarged kitchen and mudroom area. 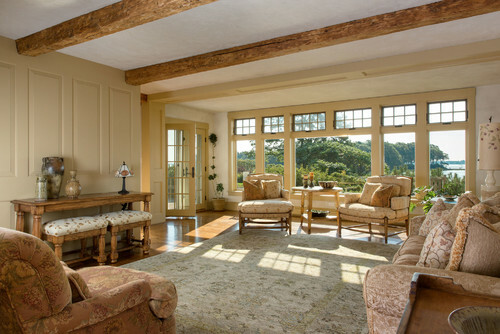 The living room beams are original to the house but actually predate it: They were reclaimed from a local barn when the cottage was built. The previous homeowners had stained them a burgundy color, so restoring the supports became part of the renovation. Original pine floors run throughout the main living spaces and vary in width. Stringer says some planks are up to 10 inches wide. The sanded-plaster walls are also original to the home and were replicated in the addition. “We wanted to match the original sanded-plaster walls that were in the summer cottage, so that everything flowed and the transition was smooth between the old and new sections,” Stringer says. 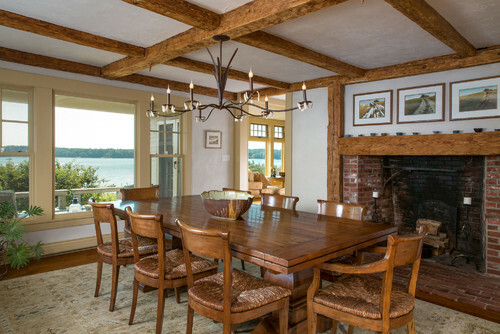 Adjacent to the living room, the dining room shares the same water view and pared-down finishes. A custom chandelier above the alder table mixes an Early American vibe with contemporary design. Its leafy center references marsh grass and oyster shells dangle from the candlestick bases. The soffit running above the island marks where the original kitchen ended. Now enlarged, the space segues into a sitting room in the addition. Salvaged beams, wide-plank wood floors, alder cabinetry, and an island finished in distressed black milk paint create a warm, cottagey vibe. 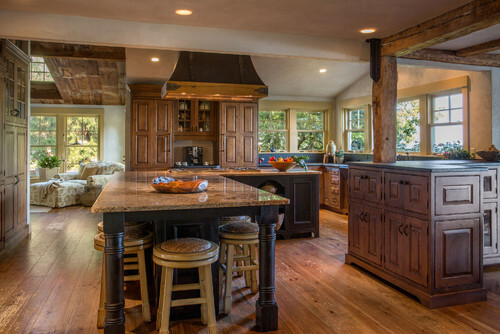 The granite countertops on the periphery have been flamed and wire brushed to give them a rustic, matte appearance. Reclaimed barnwood was brought in from Pennsylvania for the sitting room’s ceiling. 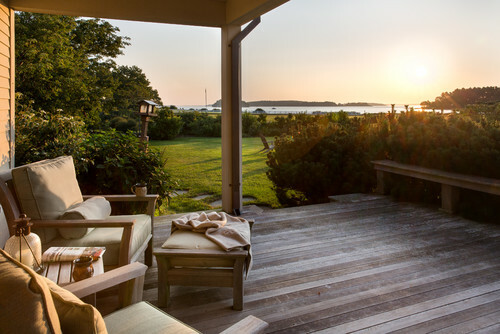 The home sits on the northern part of the island and has near-panoramic water views. 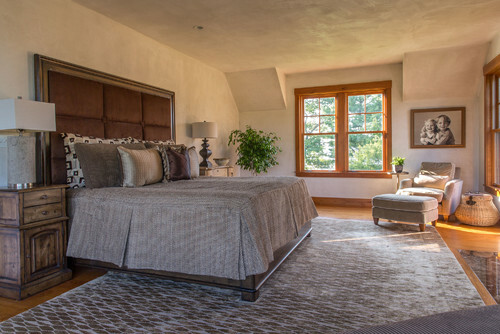 The master suite takes advantage of this vantage point with windows on three walls. The homeowners dismissed the idea of window treatments and Stringer kept the palette neutral to emphasize the view. The bedcover, custom-made in Stringer’s workroom, is a unique fabric composed of strings; the wool-and-silk-blend rug catches the light streaming into the space. The master bath features a chiseled-stone backsplash inspired by the nearby mountains that homeowner Tracy likes to climb with the family’s Labs. Cabinet pulls made of rocks are another nod to the outdoors. Despite the beauty and craftsmanship of the renovated home, nothing beats the view from the rear porch off the living room.